Everyone wants a workhorse running back, and history shows that rostering one basically guarantees you a championship. From Bell to DJ and now Gurley, having a top 2 bell cow come playoffs is like starting another QB on your team. However, my claim is: Don't fool yourself into thinking that you can draft 2 RB1s. Approximately 50% of running backs taken in the first 2 rounds either bust or perform much lower than their ADP implies. It is well documented that running backs are prone to more injuries than the rest of the offensive positions. Still, 2017 somehow only lost David Johnson among the 11 running backs taken in the first 24 picks. Even with this good fortune, several players underperformed their ADP, including Freeman, Howard, Murray, and Ajayi. Throwback to 2016, Todd Gurley, Adrian Peterson, Jamaal Charles, Lamar Miller, Doug Martin, and Eddie Lacy fell flat (all were ranked inside ESPN's top 24). So while hitting on a running back is much tougher, the rewards are league winning. That's why many are drafting 2-3 running backs out the gate. I've seen Antonio Brown fall to pick 7 multiple times in Fantasy Football Calculator mocks. Odell is consistently going at slot 10! We'll get into my thoughts on the current ADPs and my ongoing strategy later. Right now we need to discuss the public possibly overcorrecting on an abnormal 2017 season. Tons of articles calling for "the death of the workhorse back" were written after the renown 2015 WR season. Maybe it's time we don't extend ourselves too much like previously. 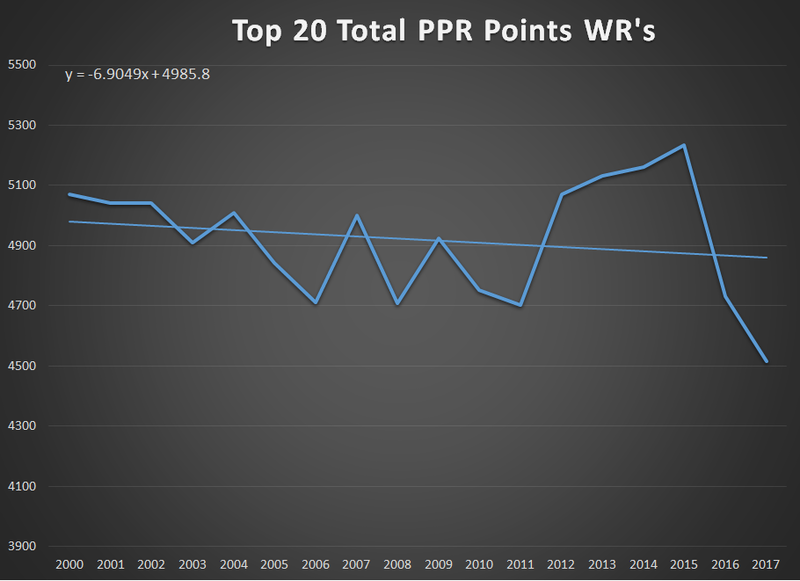 Taking at look at the production of the top 20 wide receivers, and even the top 40, we can see a massive lack of PPR points in 2017. The culmination of a disappointing 2016 season for WR1s is adding to this massive shift in draft strategy as well. But look at how much of an outlier last season was. It brings back eery similarities to the abnormal season for wideouts just 3 years ago. But the solid trend still applies: the NFL, being the passing league that it is, is spreading more receiving yards to the WR2 and WR3 roles on teams. Passing yards is indeed increasing as whole, as more teams are finally figuring out the efficiency gains netted from throwing over running. However, last year veered from those shifts as well! Passing yards have been increasing significantly each year until it took a major dip last season. The steady growth of the WR2s and WR3s in fantasy production have been seen as well until last year's massive drop off. Even passing touchdowns took a slight hit. But remember, teams are passing more! The downward trend of rushing yardage seems to be the most stable of the bunch! There is no doubt in my mind that last year's passing yardage, passing touchdowns, and wide receiver production will not repeat itself or continue downwards. I've also gathered some statistics from JJ Zachariason's Late Round Podcast that really highlight how strange last season really was. ALL WRs in '17 scored 16,019 points, over 2000 points less than 2016! In my opinion, there are a lot of reasons for the abnormal year, and the chance to rebound this upcoming season. The league's most talented player and the projected ROTY went down. As a football fan, losing OBJ hurt me the most. Luck's absence is often forgotten as well. Multiple QBs played worse than usual (due to injury as well) and should return to their mean level of play (Winston, Mariota, Ryan, and Carr to name a few). Even more QBs with a year under their belt get the chance to break out as well (Mahomes and Trubisky). We also just had the most QBs drafted in the 1st round since 1983! However, let's get things into perspective. DON'T EMPLOY ZERO RB. I'm pretty sure that is obvious to you. But don't kid yourself into thinking that drafting in the late 1st round will get you two stud rbs to ride to the 'ship (I made that mistake last year with Freeman and Ajayi). Look at opportunity! Kamara, Hunt, Freeman, Howard, McCaffrey, and McKinnon will AT MOST get 20 touches in a game. I'll just talk about Hunt and Kamara since the other names are self-explanatory. Don't let coach-speak get to you! We saw what Andy Reid did to Hunt last year. After starting 5-0, then going 1-6, the Chiefs gave Matt Nagy offensive duties and Hunt finally got more than 10 carries. Come playoffs when Nagy already accepted his Bears job, Reid gave Hunt only 11 rushes. Now with Ware healthy and Damien Williams & Kerwynn Williams on the roster, I'm not buying that Hunt will get a bunch more targets. Plus does Mahomes even know what a check down is? The New Orleans Advocate anticipating Kamara to get 14-15 carries represents his CEILING! He already had 9-12 carries and 5-7 receptions per game last year! The Saints will not have a 1:1 passing to rushing TD ratio again (go back to usual 2:1). Also, who wants points in weeks 1-4?. If you're reading this article, I have full confidence that you can make the playoffs. It's June, what are you doing here? Drafting a bell cow is extremely important to fantasy success and I have no problem if some owners feel like they have to secure Gordon, Fournette, or Cook at the end of the first round. I have two conflicting sentiments. If the idea is that there are more "workhorse" rbs now, then shouldn't WR1s be more valuable and what I should use my draft capital on? There are bunch of rookies who will be getting a lion's share of opportunity, have draft capital, and are going in later rounds (Penny, Michel, Guice, Freeman, and Jones). Also running backs from Green Bay and Mark Ingram are available much later as well. Then again, this year's RB position is seen to be top heavy. This is why I think going 2-3 RBs early is BEST CASE scenario, something that is unlikely to actually come to fruition. Drafting McKinnon as a RB2 over Mike Evans and AJ Green is the latest example of something that hurts my soul, but I can understand. But seeing fake bell cows go before WRs with huge target shares, high floors, and tremendous upside hurts me even more. One point of this article is to not let AB, Hopkins, OBJ, Julio, MT, or Keenan Allen go by you when the RBs available do not have more than 20 touch potential (meaning not a true workhorse). My MAIN point is that if you are able to choose your draft spot, don't overthink or fool yourself. Get a top 4-5 pick. Secure your bell cow. The fact that studs like Green and Evans are even available at the 2/3 round turn is a travesty. All the more reason to secure an early spot. For me, if those spots are taken, I'd go with the 7th pick and snag Saquon and hopefully Allen. But that's just me. Check out our YouTube page! Daily mock, draft strategy, and top 5 videos!